A HORIZON: The surface mineral horizons where some have organic matter accumulation. They are usually darker in colour than the lower horizons. If they are lighter in colour, then the horizons have lower silicate clay and/orcontent (). The surface mineral horizon with some organic matter accumulation. Usually darker in colour than the lower horizons. If lighter, then the horizons of lower silicate clay or sesquioxide content (The National Committee on Soil & Terrain, 2009). ·	A3 horizon - Transitional horizon between the A and B horizons but has predominantly A horizon properties. 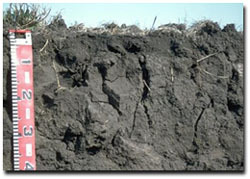 A1 Horizon - Soil surface (if no O Horizon present) with some organic matter content. Usually darker in colour than horizons below with biological activity. Can be subdivided into A11, A12, A13 etc. subhorizons. A2 Horizon - It is usually paler in colour from the A1 horizon. It can have less organic matter, sesquioxides, silicate clay. A3 Horizon - Transitional horizon between the A and B horizons but has predominantly A Horizon properties. ACIDIC: Soils with a pH less than 7.0 in water. While some plants thrive in acid soils, others don't and require lime to make the soil more alkaline. This term is also used as a Subgroup distinction for a number of Soil Orders in the Australian Soil Classification (Isbell, 2002). It refers to soils with a B2 horizon that on the whole is strongly acid. and/or the leaching of the soil by rainfall. AEOLIAN: A geomorphic process whereby soil forming material is transported and deposited by wind. AERIC: This term refers to soils that are rapidly drained throughout the whole profile. The B horizons are weakly coherent and porous and are often brightly coloured. This term is used as a suborder to describe Podosols in the Australian Soil Classification (Isbell, 2002). AEROBIC: Soils in which free oxygen is abundant and chemically oxidising processes prevail. This usually occurs in well drained soils with good structure. ALLUVIAL: Alluvial refers to sediment deposition in riverine landscapes. ALLUVIUM: Alluvium is the sediment deposited from transportation by channelled stream flow or over-bank stream flow. ANAEROBIC: These are soils that are deficient in free oxygen and where reducing processes predominate. This condition generally occurs in poorly drained or waterlogged soils. Water has replaced the air, resulting in a bluey-grey coloured soil. ANGULAR BLOCKY STRUCTURE: A cube-shaped ped where soil particles are arranged around a point, bounded by six relatively flat, roughly equal faces. See also sub-angular blocky. ANTHROPOSOLS: These soils result from human activity e.g. mine spoil where origin soils may be buried and new parent material introduced. A Soil Order of the Australian Soil Classification (Isbell, 2002). Ap HORIZON: The A horizon is the surface of the soil. The 'p' denotes disturbance by man e.g. ploughing, deep ripping. Mc Donald et al. (1990). APEDAL: These soils are either single grained (incoherent) or massive (coherent). Peds are not apparent when the soil is moderately moist. AQUIC: These soils have stagnant water on the soil surface and/or can be saturated in some part of the upper 0.5 m of the profile, more or less continuously for 2 to 3 months. In this condition, the soil is free of dissolved oxygen. Gley (bluey-grey) colours are often an indication of prolonged saturation. The definition is used as a Suborder distinction for Podosols and Vertosols in the Australian Soil Classification (Isbell, 2002). ARENIC: Soils in which at least the upper 0.5 m of the profile is non-gravelly and of sandy texture throughout. It is also loosely or weakly coherent (see consistence) and may have aeolian (wind-blown) cross-bedding. This term is used in the Australian Soil Classification (Isbell, 2002) to describe Rudosols and Tenosols. ARGIC HORIZON: A subsoil horizon consisting of distinct lamellae that are sharply defined, horizontal to sub-horizontal layers that have a higher clay content than adjacent sandy or sandy loam material, usually 5 to 10 mm thick. Consistence is stronger and the colour usually darker and more reddish or brownish than the surrounding soil. This term is used as a definition for Calcarosols, Kandosols and Tenosols in the Australian Soil Classification (Isbell, 2002). Argic horizons in a sandy Tenosol in the Wimmera region. AUSTRALIAN SOIL AND LAND SURVEY - FIELD HANDBOOK (The Yellow Book) : Mc Donald et al. (1990). This handbook specifies methods, standards and terminology used for the description of soil sites. It provides a national reference set of definitions and has been designed for field use. AUSTRALIAN SOIL CLASSIFICATION: (Isbell, 2002). The Australian Soil Classification was developed by Ray Isbell (CSIRO Land and Water) in collaboration with land resource assessment staff throughout Australia. It serves as a framework for organising knowledge about Australian soils and provides a means of communication amongst scientists and those who use the land. It is useful for those involved in environmental studies and for teachers of soil science. The Australian Soil Conservation Council formally endorsed the new classification in 1992 and recommended its adoption by all States and Territories and its use in all future Federally funded land resource inventory and research programs. The Australian Soil Classification was first published in May 1996 and the second edition in 2002. It is available from CSIRO Publishing, PO Box 1139, Collingwood, Victoria, Australia 3066. An Australian Soil Classification Online (external link) version exists on the Australian Collaborative Land Evaluation (ACLEP) website under ACLEP activities. B1 Horizon - Transitional layer between the A and B horizons but dominated by B Horizon properties. B2 Horizon - Has the dominant feature of greater clay, iron, aluminium, humus and/or maximum development of pedological organisation. May be divided into subhorizons B21, B22, B23 etc. B3 Horizon - Transitional layer between the B and C horizons, dominated by B Horizon properties but integrating into the C material below Mc Donald et al. (1990). BASE STATUS: Is a ratio relating the major nutrient cations (Ca, Mg, K and Na) to the clay percentage in the soil. It is used as an indicator of soil fertility and is expressed in cmol (+) kg-1 clay. It is calculated by multiplying the sum of the reported basic cations by 100 and dividing by the clay percentage of the sample. Three classes are defined: dystrophic - if the sum is less than 5 (indicating low inherent fertility and/or strongly weathered profile); mesotrophic - if the sum is between 5 and 15 inclusive (indicating moderate inherent fertility and/or moderately weathered profile); and eutrophic if it is greater than 15 (indicating relatively high inherent fertility and/or low degree of profile weathering). It is used for some Great Group distinctions within the Australian Soil Classification (Isbell, 2002). BASIC: This term is used to describe Tenosols, Organosols and Rudosols in the Australian Soil Classification (Isbell, 2002). It refers to soils that are not strongly acid or calcareous. Bh HORIZON: A subsoil horizon notation whereby the 'B' refers to the B Horizon and the 'h' to the humic horizon. Organic matter and aluminium compounds are strongly dominant (with very little or no trace of iron compounds). This term is used as a definition for the Podosol Order in the Australian Soil Classification (Isbell, 2002). Bh horizon at 30-40 cm depth in a West Gippsland Podosol. Bhs HORIZON: A subsoil horizon notation whereby the 'B' refers to the B Horizon and the 'hs' to the humosesquic horizon. Iron and organic compounds (often referred to as 'coffee rock') are prominent within the horizon and the organic compounds are distributed as streaks, patches or lumps. Humosesquic is used as a (Bhs horizon) definition for the Podosol Order in the Australian Soil Classification (Isbell, 2002). Bk HORIZON: A subsoil horizon notation whereby the 'B' refers to the B Horizon and 'k' to an accumulation of carbonates (usually calcium carbonate) within the associated horizon. BLEACHED HORIZON: Horizons that are paler than adjacent horizons. They are best viewed when the soil is dry. A bleach is generally associated with the A2 horizon although it is not restricted to this layer. It generally occurs on top of a much less permeable subsoil, pan or hard rock. A conspicuously bleached horizon is one in which 80% or more of the horizon is bleached. A sporadic bleach occurs irregularly throughout the horizon or as blotches at the interface of the A and B horizons (Northcote, 1979). This horizon is the most leached part of a soil. Organic matter, clay, iron, aluminium and nutrient elements have all been removed, leaving an accumulation of silica giving the horizon its whitish colour. Field observations have established that bleached horizons are often saturated with water and their occurrence is usually an indication of periodic waterlogging. This can indicate sodic subsoils where there is a strong texture contrast between A and B horizons. BLOCKY STRUCTURE: A cube shaped ped. See also sub-angular blocky and angular blocky. Bs HORIZON: A subsoil horizon notation whereby the 'B' refers to the B horizon and the 's' to the sesquic horizon. Iron compounds are strongly dominant or codominant (with aluminium) and there is little evidence of organic matter. Sesquic is used as a Great Group definition for the Podosol Order in the Australian Soil Classification (Isbell, 2002). BUCKSHOT: Describes generally rounded, hard (small to medium sixed) ferruginous concretions. BUFFERING CAPACITY: The soils ability to resist change in pH. Soils with a high clay and organic matter content have a higher buffering capacity and can tolerate the addition of acidifying fertilisers over an extended period, or at a higher rate of addition without becoming too acid. But once it is acid, the soil will require a large amount of lime or dolomite to reverse the effect. The amount of lime or dolomite required varies from soil to soil depending on the pH (Baker and Eldershaw, 1993). CALCAREOUS: It describes a soil that has sufficient calcium carbonate to cause effervescence after the application of a few drops of hydrochloric acid. The calcium carbonate can either be in the form of carbonate segregations or fine earth. Calcareous is used as a descriptive term for Ferrosols, Hydrosols, Organosols, Rudosols and Tenosols in the Australian Soil Classification (Isbell, 2002). CALCAROSOL: A Soil Order of the Australian Soil Classification (Isbell 2002). 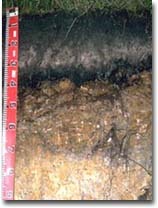 These soils are either calcareous throughout the solum (or at least directly below the A1 horizon or at a depth of 0.2 m, which ever is shallower) and do not have clear or abrupt textural B horizons. The carbonate must have resulted from soil forming processes. CALCRETE: A layer where cemented carbonate accumulation has occurred. The material must be hard in a pan or in the substrate. This definition does not describe the common soft carbonate nor the carbonate accumulated in nodules or concretions. This term is used to describe a number of soils in the Australian Soil Classification (Isbell, 2002). Calcrete layer at 20 cm depth in a Calcarosol near Walpeup. 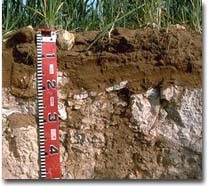 CALCIC: These soils have a Bk horizon or a subsurface layer containing 2 - 20% soft carbonate and 0-20% hard calcrete fragments and/or carbonate nodules. This term is used to describe a number of Soil Orders in the Australian Soil Classification (Isbell, 2002). CEC (CATION EXCHANGE CAPACITY): Is the measure of the capacity of a soil to hold the major cations: calcium, magnesium, sodium and potassium (including hydrogen, aluminium and manganese in acid soils). It is a measure of the potential nutrient reserve in the soil and is therefore an indicator of inherent soil fertility. An imbalance in the ratio of cations can result in soil structural problems. High levels of individual cations (e.g. aluminium and manganese) can also be toxic to plants. CEMENTED: Indurated substances such as humus, calcium carbonate and the oxides of silicon, iron and aluminium can bind soil particles together in a hard brittle mass. This hardened state persists even when wet. C HORIZON: Layers below the solum (AB profile) lacking pedological development. Includes consolidated rock and sediments that are generally weak in strength. CHROMOSOL: Soil Order of the Australian Soil Classification (Isbell, 2002).. Soils with a clear or abrupt textural change at the B2 horizon where the pH is 5.5 (water) or greater in the upper B2 horizon. The B2 horizon is often brightly coloured. COFFEE ROCK: A compacted, cemented or indurated layer within the profile that is comprised of humus and iron oxides. Thick coffee rock layer (Bhs horizon) from 80 cm depth in a Cranbourne Podosol. COLLOIDS: Fine clay and organic matter material with a particle size of less than 0.002 mm in diameter. These particles tend to remain permanently in suspension unless flocculation (aggregation of particles that settle out) occurs. COLOUR: Soil colour is assessed in a moist condition using a Munsell Colour Chart (Munsell Colour Company, 1975) to assess the dominant colour. Secondary colours, bleaches and mottles are also recorded. Colour provides a useful indication of a number of profile attributes. 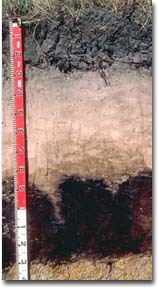 Dark surface soils, for instance, indicate a high level of organic matter. In a subsurface A2 horizon, bleached colours indicate low levels of plant nutrients and that seasonal or periodic waterlogging occurs. 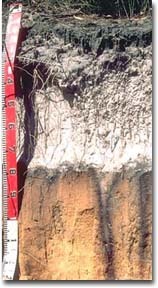 In subsoils, the colour sequence from red to brown or yellow to grey colours, indicate a sequence from well aerated and well drained soils to poorly aerated and poorly drained soils. The tables below are used to obtain colour classes in the Australian Soil Classification (Isbell, 2002). COLUMNAR STRUCTURE: Soil particles are arranged around a vertical axis with flat faced peds. The tops of the columns have clearly defined domes. 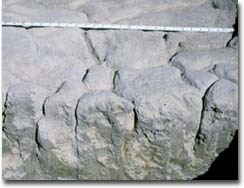 Columnar structure is often associated with subsoil sodicity. Columnar structure in the subsoil of a Corangamite Sodosol. COMPACTION: The process whereby soil density is increased as a result of tillage, stock trampling and/or vehicular trafficking. Compaction can lead to lower soil permeability and poorer soil aeration resulting in increased erosion hazard and poorer plant productivity. More information about compaction is available in the Soil Health section of this website. CONCHOIDAL FRACTURING: A mass of soil which has obvious concave fracturing (ball and socket appearance). This is associated with severe compaction and remoulding (disturbed in a moist to wet conditon.). It is best seen in a soil pit exposure when material is removed with a mattock or pick and has the appearance of fractured bluestone. Conchoidal fracturing is most likely to occur just beneath the surface of clay soils (Vertosols) and if the soil has been compacted (e.g. vehicular traffic) whilst in a moist to wet condition (i.e. wetter than the plastic limit) for prolonged periods. Conchoidal fracturing is evident in the 10 - 30 cm zone of this Grey Vertosol. CONSISTENCE: Consistence indicates a soils resistance to deformation and is a measure of the degree of cohesion. It is measured by the resistance of a ped to deformation between the thumb and forefinger. According to Australian Soil and Land Survey Field Handbook Mc Donald et al. (1990) consistence can be measured on a scale of 1 (small force required) to 7 (rigid force required). This varies depending on the soil water content. Consistence relates to the texture and structure of a soil and is a measure of its workability and stability, or behaviour when manipulated e.g. friable soils are easier to work than hard soils. 0 Loose No force required, separate particles such as loose sand. 1 Very weak Very small force. 2 Weak Small but significant force. 3 Firm Moderate or firm force. 4 Very firm Strong force but within the power of the thumb and forefinger. 5 Strong Beyond power of thumb and forefinger but crushes underfoot on hard flat surface with small force e.g. a shovel. 6 Very strong Crushes underfoot on hard flat surface with full body weight applied slowly. 7 Rigid Cannot be crushed underfoot by full body weight applied slowly. CRUMB STRUCTURE: Rounded peds less than 12 mm in diameter which are unstable and tend to crumble into smaller units. This type of structure is associated with surface horizons. 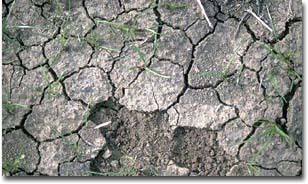 CRUSTY: Soils with a massive or weakly structured surface crusty horizon (3 cm or less thick). It is often lower in clay content than the underlying non-self mulching structured clay. This term is used as a Great Group definition for Vertosols in the Australian Soil Classification (Isbell, 2002). Crusty surface soil in northern Victoria.